It was still hot in Los Angeles, the Santa Ana winds were blowing in from the desert. I went up to the studio and opened the windows. The smell of the restaurant downstairs drifted up, the traffic moved slowly on the boulevard and I stood there watching the lights change for a long time. 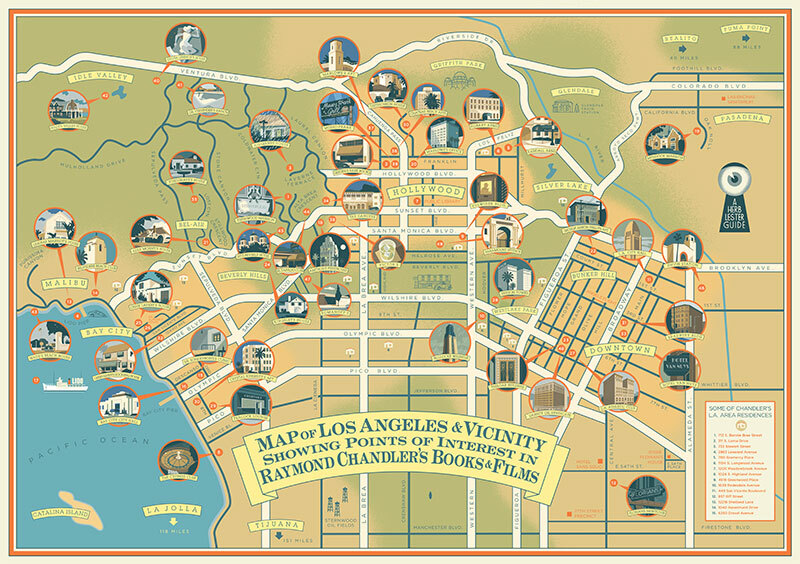 What this town needs is a good map, one with every location from Raymond Chandler's books, one that shows everything from the Sternwood Mansion and Gieger's bookshop to Union Station and the spot where Romanoff's used to be, from Puma Point to the Lido Pier where no one is really positive about who killed Carmen's chauffeur. I called up an old friend, Ben Olin, he works at a place that makes maps and guidebooks. His voice was relaxed and cool. "Herb Lester Associates." 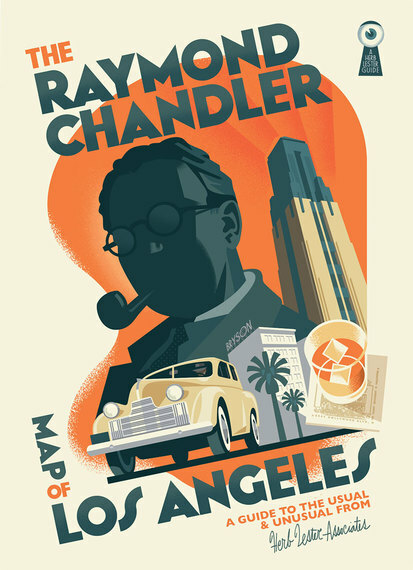 "Hello Ben, what this town needs is a good map, one with every location from Raymond Chandler's books, one that shows everything from the Stern-"
He cut me off, "Yeah, sounds good. How much is this going to cost me?" "I get $50 a day plus expenses." "You don't put up much of a fight"
"There's not a lot of money in this business if you're honest." "What about a design that looks like one of those Dell Mapback books from the 1940s?" Ben was on the right track, as usual. He was talking about a series of cheap paperbacks that had a map on the back cover that showed the locations from the story. They had a nice quality to them and the style was a perfect fit for this new map. "I'll send you something in a few days." I hung up. I went home and started re-reading Chandler's novels, and making a list of every location in every book. 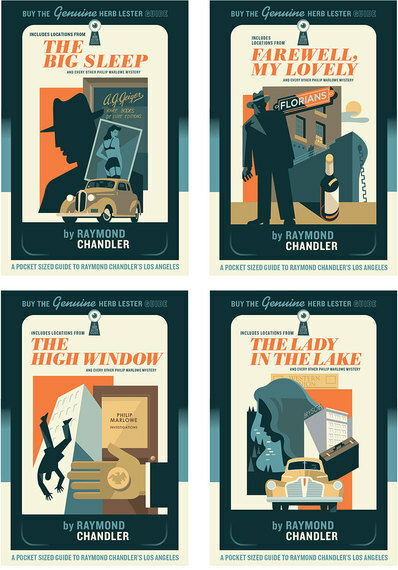 Some were actual buildings that were still standing, others were long-gone, some spots were real places but had fake names; private-eye Philip Marlowe's office building on Hollywood and Cahuenga is still there, Florian's Nightclub was a fictional joint down on Central Avenue, Bay City stands in for Santa Monica. 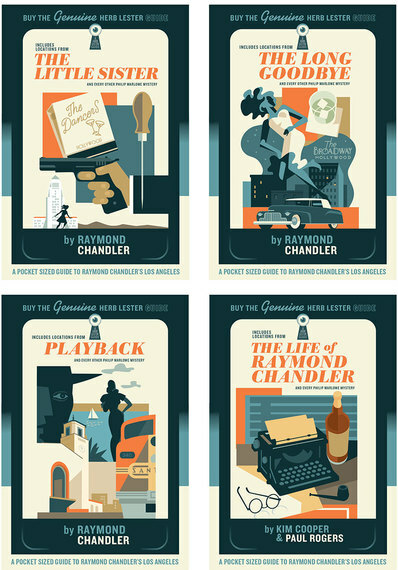 I watched every movie made from the novels and also made a list of important locations from Chandler's life. I was going to need some help on this job. 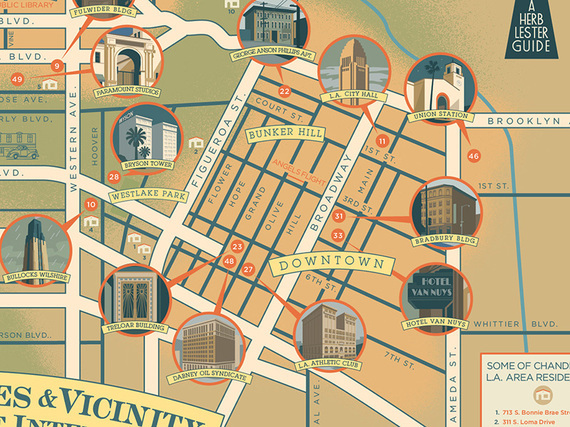 Someone was going to have to write the text for the back of the map, someone who knows these mean streets but who is not themselves mean, a writer who is not tarnished or afraid. A complete man and a common man, yet maybe someone who is not a man at all. A writer who writes with rude wit, a lively sense of the grotesque, a disgust for sham, and a contempt for pettiness. "Kim Cooper." She answered her own telephone. "What this town needs is a good map, one with every location from Raymond Chandler's books, one that shows everything from the Stern-"
She cut me off, "Yeah, sounds good. Is there any money in it?" "I think my client can cover your expenses, maybe enough for a couple of gimlets." She laughed into the phone. "Send me your list of locations and I'll see what I can do." Kim is a historian and novelist, she and her husband Richard Schave run a nice little racket called Esotouric taking people around the city on bus tours of historic and literary locations. She knows some things about Raymond Chandler that nobody else does. She knows that Mike Mazurki, the actor who played Moose Malloy used to run a restaurant in the Elks Building across from MacArthur Park. Jack Smith also knew that, but he's dead. The map doesn't include everything, no map could. We probably missed one or two important spots, we left off some of the joints that are only memories; drive-ins with gaudy neon and the false fronts behind them, sleazy hamburger joints that could poison a toad. Los Angeles has changed a lot since Chandler's day when it was just a big dry sunny place with ugly houses and no style, when people slept on porches and lots offering at eleven hundred dollars had no takers. 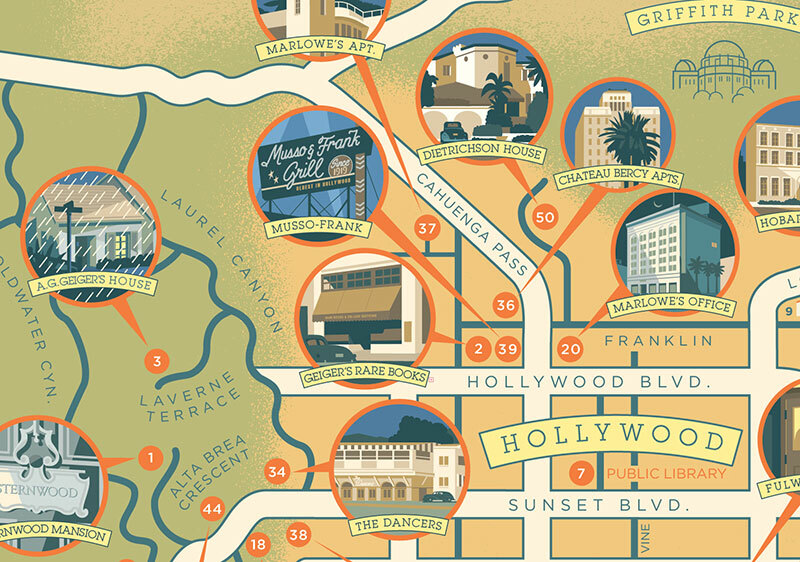 But you can still make the drive down Wilshire all the way to the ocean, you can still poke around the alleys and side streets of Hollywood, and the eucalyptus trees still give off a tomcat smell in warm weather. You can't get a drink at Victor's any more but Musso's is still open. Park out back, only tourists and suckers go in the front door.